From special occasions to everyday celebrations, a home-baked cake takes the cake. My mother has told me numerous times that when she was growing up a made from scratch cake was a routine dessert. She says that that was back in the olden days when people had more time to spend in the kitchen and no one was worried about diets and calories. In today’s world, cakes are popular still for birthday and wedding celebrations, for special parties, and—often—“when it is time for a little something” as Winnie the Pooh would say. As hard as it is to admit, the homemade cake has seemed too have fallen from favor. The main reason for this fallout could very well be that cooks perceive cakes as time consuming and complicated. But we do not have to give up on the art of cake baking. Marvelous cakes can start with a mix and look fabulous without taking lots of time to make. I know you’re worried about being guilty of having that "box cake mix" taste that seems to be present in many rushed cakes. By simply adding different spices or even flavorings like lemon, orange, or butter you can take a cake form ordinary to extraordinary.Take a white cake mix, add almond extract, egg whites, maraschino cherries, miniature chocolate chips, and you’ll have a Cherry- Chocolate Chip Cake. With delicious flavors in the double digits, Betty Crocker has what everyone wants in a cake mix today: quality, ease, and versatility. 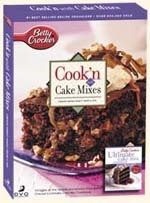 Here at Cook’n we have teamed up with Betty Crocker to bring you Cook’n with Cake Mixes. This CD provides you with hundreds of delicious cake mix recipes from Betty Crocker's Ultimate Cake Mix Cookbook that will leave your guests wondering how you ever found the time to bake from scratch.  LIVE VOTE: Do You Prefer White or Dark Turkey Meat?